After finishing the effortless garter stitch of the Cameo scarf, which was absolutely perfect knitting for a return bus journey to Austria, my thoughts immediately turned back to finishing up what I bought at Wonderwool last year, and so the fivemoons Diana was duly wound and a new pullover cast on between naps last Sunday. 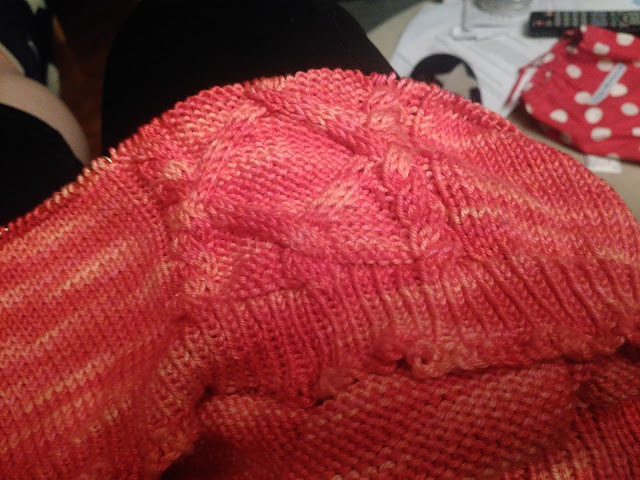 This weekend I have joined the second skein and finished the waist decreases. It's working up beautifully: lustrous and soft and with amazing colours. I don't think I will finish it before Wonderwool, but I am feeling quite pleased with myself, as this leaves just one garment's worth of yarn left, plus the random silk I impulse-purchased from Knitwitches and the snuggly soft single skein from Triskelion. This should mean I have free rein at Wonderwool in a fortnight but I fear that the six garment's worth of yarn I have acquired since last year's Wonderwool and not yet touched might prey on my mind a little. I am planning a sizable donation to the Air Ambulance table though, so that might help to offset new purchases.